All hell breaks loose when the runners meet-up with an important contact at the zoo. Working off an official published adventure has been an interesting experience. It’s incredibly handy in a lot of ways, with lots of pre-made stat blocks for all the NPCs, hefty amounts of colorful descriptions, and even suggestions for how to tweak the challenge level of various encounters. Even then I can’t help but modify and change things to suit my needs. I can’t get into spoiler-y stuff just yet, but the recap episode should be especially fascinating. 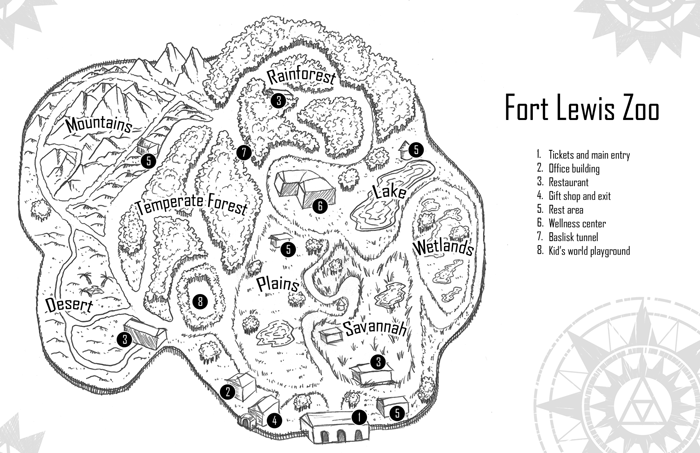 In last night’s session the players had a clear objective in front of them – meet FBI Agent Seth Dietrich at the zoo. He offered to buy back his commlink for a cool 100,000 nuyen. While the pay was certainly nice, my players were much more interested in getting some answers to this confusing mystery. Having a clear focus of where to go and what to do greatly motivates my players into tackling the objective in some fun ways. In this case they wanted to scope out the zoo location the day before the meet, and check to see if they’d be able to smuggle weapons in. 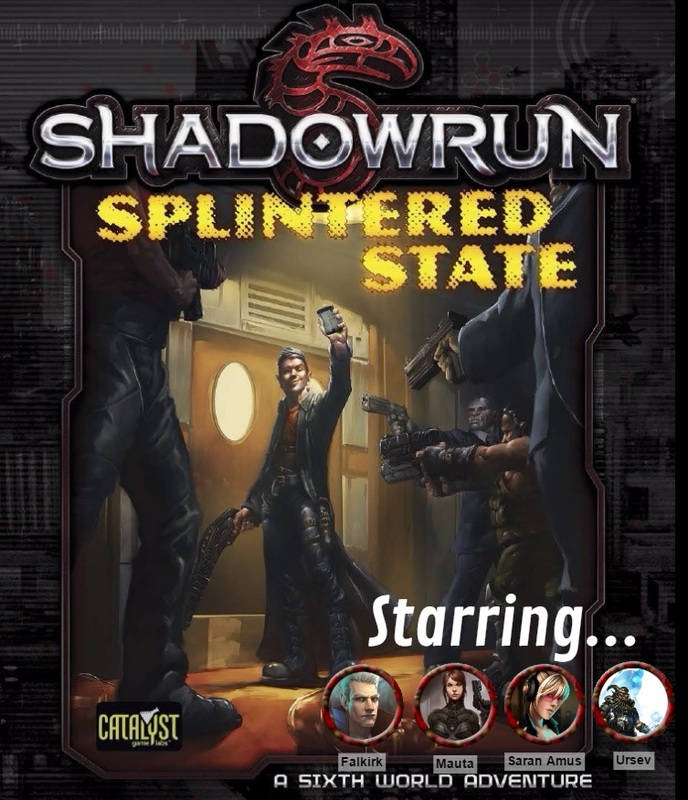 I may have made them a tad paranoid – not only is the world of Shadowrun generally violent, but this adventure has been especially action-packed as the players have been attacked left and right. In fact on their way to the zoo they noticed a car following them, and opted to pull over and ready their weapons. It proved to be a solid move as they made short work of the crazy cyborg Night Hunters that poured out of the car to attack them. A combination of Ursev’s ball lightning centered on the car and a barrage of bullets put most of the them down. I did the rest by rolling a 0 on a leaping charge attack from a very wounded attacker. I had him sail past his target and splatter on the sidewalk. Hey, as long as it’s fun I don’t mind failing miserably with my NPCs, and I’ll always play it up. At the zoo it was fun describing the various para-animals that inhabited the enclosures. Falkirk did a great job scouting out the areas and finding a hiding spot for their weapons that they tossed over the wall. They next day they waltzed in through the entrance. Well, all but Saran the decker who really wanted to hack into the extensive security in order to bring his gun inside. He had failed at this task the previous day, also for no reason other than wanting to walk in with all his gear. His team mates balked at this and finally talked him down, where he went back to the car. I don’t think the decker role suits the player very well, but that’s also on me as someone who’s still not totally on board with how decking (or rigging) work in the obtuse Shadowrun rules. Inside, the other three retrieved their weapons and met Dietrich in the reptile tunnel, next to the basilisk exhibit. Unfortunately while Dietrich’s body was there, his mind was not. It was currently occupied by someone named Jake Armitage (whom you may recognize from the old 16-bit Shadowrun game or the recent Shadowrun Returns). Armitage was just as confused as the players as to his situation, alluding to the title of the adventure as well as the confusion surrounding the missing commlink. Like any good mystery it led to more questions than answers – especially when an unseen sniper tore a hole through Armitage/Dietrich’s throat at the height of their confusion. All hell broke loose in the zoo – what you thought this was going to be easy? A pair of highly skilled assassins opened fire on both sides of the players as the basilisks burst through the glass. Falkirk and Ursev were sitting ducks, but Mauta actually got the jump on one of the assassins by being nonchalant at one end of the tunnel. There were only two assassins but they were both more powerful than any of the PCs (skill and armor wise, at least). The players were also slightly under-equipped since they couldn’t smuggle in Ursev’s battle axe or Mauta’s sniper rifle. Thankfully for them the assassins didn’t want to stick around with UCAS Military Police converging on the location. They left the runners after a single round (though not before doing some significant damage) to deal with the basilisks. My players have proven heroic in the past so I played up the screaming and crying of the crowd during the chaos, and had one basilisk attack a group of huddled school children in a corner. 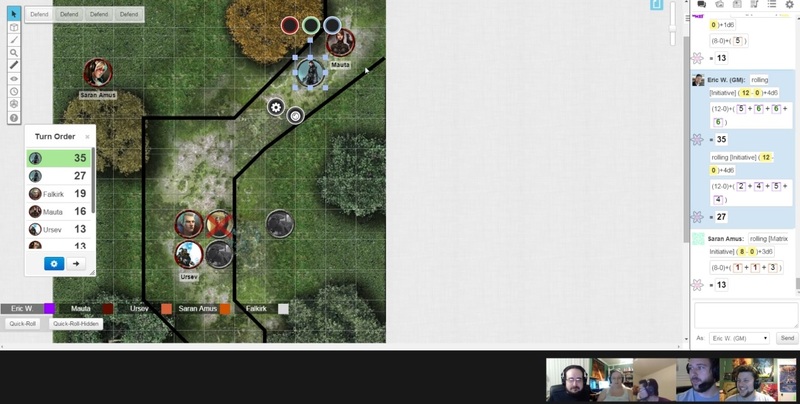 My players responded immediately with charging melee attacks and Mauta’s deadly shots, making fairly short work of the overgrown lizards – though not without a briefly enjoyable scare as one of them partially petrified Falkirk. Saran was able to watch the video feeds and then shut down one of the assassins’ cyberware and weapons, further hastening their retreat. Unfortunately he really didn’t have anything to do for the round or two where only the basilisks remained – a bad design on my part. It speaks to our ineptitude at thinking of things a decker/hacker can do, most of which isn’t written in the adventure. 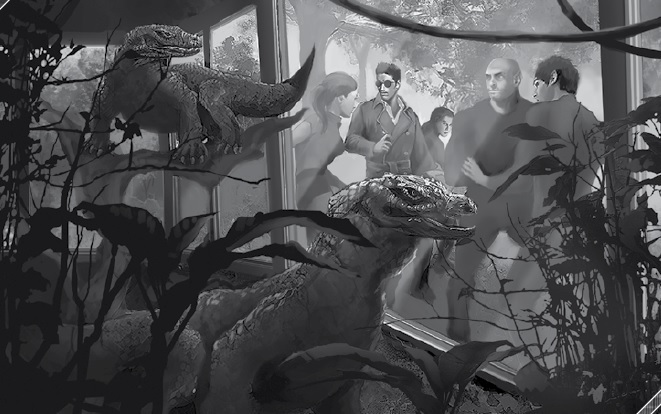 The players were able to blend in with the chaotic, surging crowd leaving the zoo, and escaped with relative ease. Mauta managed to grab the pouch of credsticks and a 2nd commlink that Dietrich had on him – something I specifically mentioned to the players during the conversation and hoped they’d remembered about. Maybe they’ll find some answers in this commlink. They also have several pending messages from some contacts and unknown parties, no doubt pertaining to this hot potato of a commlink they have in their possession that everyone wants to get their hands on. This was one of our more enjoyable sessions with lots of laughter, jokes, and fun heroic moments in combat. Tune in next week!